Sue Syljebeck played basketball for Coach Bill Probst 1993-95. She was a two-time NJCAA All-American and Kodak All-American forward for the Scots. In both seasons she led the team to Illinois Skyway Collegiate Conference championships. She averaged 18.5 points per game, 14.5 rebounds, 4.5 steals and 4.0 assists per game. She also played on the Scot’s conference championship in 1993. 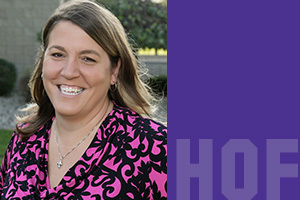 Upon MCC graduation, Syljebeck moved on to and graduated from New Orleans in 1997 with her Bachelor’s of Science degree in Human Performance and Health Promotion. After a successful playing career, she then went on to receive her Master’s of Science degree in Physical Education from Southern Illinois in 2000. From here, Syljebeck worked four years at Nichols State as an assistant and head coach. Syljebeck is currently the head coach at Siena Heights in Adrian, Michigan. “To be inducted to the Hall of Fame with Coach Probst, I consider it a tremendous honor to be inducted,” said Syljebeck.